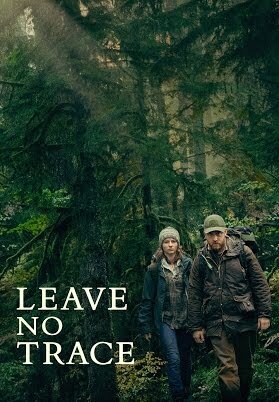 "Moving but Anticlimactic Father-Daughter Drama"
LEAVE NO TRACE is a drama about an ex-Marine with PTSD who lives in the wild with his daughter because he’s incapable of living in society any more. Rated PG, LEAVE NO TRACE is a heartfelt, captivating father-daughter drama that stands out in many ways, but the ending is anticlimactic and ultimately unsatisfying because it lacks a positive, uplifting conclusion to its plot problem, despite being free of any foul language or salacious content. LEAVE NO TRACE is a captivating drama about the relationship between a father and a daughter as they search for the freedom to live in the wild. The movie’s understated tone leaves room for incredible performances by Ben Foster and Thomasin McKenzie, while the tension and the stakes of the drama grip the viewer until the end. The PG rating makes the movie more suitable for families, but the subject matter and slow pace might not make it enjoyable for younger audiences. Also, the ending is anticlimactic and doesn’t offer a resolution to the plot problem. Away from society and modern technology, Will (Ben Foster) and his teenage daughter, Tom (Thomasin McKenzie), live simple lives deep in the forest of an Oregon national park. As an ex-Marine with PTSD, Will teaches Tom survival techniques such as covering her tracks and hiding in the wilderness, while he gives her regular drills in case the park rangers try to find their camp. The only time they leave the wilderness is to make a supply run into town. Using money from his veteran benefits, Will and Tom stock up on groceries and supplies. On their way back into the national park, they stop at a similar camp full of war veterans. Will makes some extra cash by selling his prescription medicines to the vets. Will and Tom enjoy their lives until the police and park rangers storm their camp. Both are taken into Social Services and questioned about their reasons for living in the wild away from society. When it becomes clear that neither are a danger, Will and Tom relocate to a small home on a farm. Tom assimilates well to farm life, but Will struggles to be a participating member of society. When Will decides he can’t take it anymore, he takes Tom on the run up to Washington so the two can return to their lives in the wild. However, Tom isn’t so sure that their old life is the best thing for them anymore. Eventually, the struggles of surviving the wild and being on the run create a rift in their relationship. LEAVE NO TRACE stands out as an exceptional movie in many ways. Ben Foster gives a tortured and heartfelt performance as Will, while newcomer Thomasin McKenzie carries the movie with her depth of emotions. This father-daughter relationship is the heart and soul of the movie, and both performances sell the tight bond between Will and Tom. Throughout the movie’s deliberate and contemplative pace, the stakes are not only physical survival but also the emotional survival of Will and Tom’s relationship, including the effect their trials have on their relationship. With gorgeous cinematography in the backdrop of the Pacific Northwest, LEAVE NO TRACE is always riveting to watch from start to finish, but the unresolved open ending detracts from the movie’s power. LEAVE NO TRACE also deals with some important themes in a subtle, contemplative way. Will and Tom enjoy their simple lives away from society. Tom makes a point to say that her father is an excellent teacher when questioned if she should be in school. However, the Social Services authorities become concerned about Tom’s social skills. Will fears society and doesn’t know how to assimilate, while Tom embraces the community aspect of living among people. Numerous times throughout the movie, Will tries to escape people, only to find himself in need of the help of a community to survive. As Tom witnesses more of the beauty of a community of people “bearing one another’s’ burdens,” she no longer wants to live alone with her father. It becomes clear that Will’s PTSD (and perhaps some other mental disorders from his service in the military) have damaged his ability to integrate himself fully into society the way that Tom can. While he still wants to give Tom a good life and a good education, his inability to become part of a community becomes a problem. He also has a dislike for the government but at the same time doesn’t have a problem taking veteran benefits to survive. This complex dichotomy creates a moral and political gray area for a movie that’s more interested in telling a personal story than a political one. With a PG rating, this personal story isn’t bogged down by explicit content or foul language. This lack of overt negative, immoral content makes the story much more enjoyable. However, the movie has other problems that stop it from being really family friendly. For example, despite his love for his daughter, Will’s preference for living in the wild clearly endangers her life and stifles her growth. Both he and Tom actively go against the wishes of Social Services. Also, while on the run, they take matters into their own hands, sometimes by breaking into cabins for shelter or stealing food. Finally, when they start living in the home on the farm, they start going to church to appear more stable to the well-meaning Social Services bureaucrats. In the church, Tom becomes fascinated with faith in God. After reading a church brochure, she tells her father, “Did you know God created Frogs,” but Will sarcastically replies, “Says who?” Finally, although Tom eventually decides to become part of society or the community, she doesn’t explore the idea of God and faith any further. Neither do she and her father reconcile at the end as they go their separate ways. Thus, LEAVE NO TRACE doesn’t give viewers an uplifting, happy resolution to the plot problems in its story. It just comes to the anticlimactic, unsatisfying conclusion that the father is incapable of living in society while his daughter can no longer live in the wild. As the daughter tells her father at one point, “What’s wrong with me isn’t what’s wrong with you.” The movie makes both characters sympathetic, but media-wise viewers probably will side more with her and think the father should have made more of an effort to stay with his daughter. MOVIEGUIDE® advises caution for LEAVE NO TRACE. Morally questionable acts such as illegally living on public land, characters go on the run in defiance of state orders, and characters commit illegal acts to maintain their freedom, such as breaking into a cabin, stealing food, and lying about their identities. LEAVE NO TRACE is about a father and daughter as they live in the wild. Will, an ex-Marine with PTSD, and his daughter, Tom, enjoy their lives living alone in the Oregon wilderness until park rangers storm their camp. Both are taken into Social Services and forced to return to society on a farm. When Will decides he can’t take it anymore, he takes Tom on the run to Washington so they can return to their life in the wild. However, Tom isn’t so sure their old life is the best thing for them. Consequently, a rift develops in their relationship. Rated PG, LEAVE NO TRACE is a heartfelt father-daughter drama that stands out in many ways. Ben Foster and Thomasin McKenzie deliver fine performances as the father and daughter. The movie’s dramatic tension and stakes will grip most viewers. LEAVE NO TRACE has no foul language or salacious content. However, the unresolved ending is anticlimactic and unsatisfying. Also, the father doesn’t believe in God, though the daughter’s attracted to faith at one point. MOVIEGUIDE® advises caution for LEAVE NO TRACE.